and how Pocahontas helped Ellen through challenging times. *These are NOT exhaustive lists, just a place to begin! 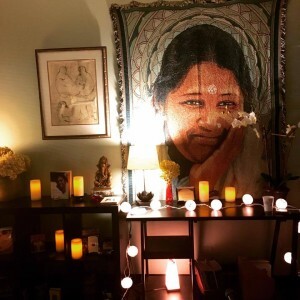 Ellen personally invites you to learn more about humanitarian, educator, cultural ambassador and her spiritual teacher, Amma. If you’re in the Chicagoland area, you can visit her ashram in Elburn. Ellen has been in private practice as a psychotherapist in Palm Springs, California since 1983, and before that she worked as a music therapist in Ohio and California. She moved to Chicago in 2003, and currently practices both in Northbrook and downtown Chicago. Educated at the University of Michigan, UCLA and Vassar College, she received advanced training at Columbia University and California State University at Fullerton. With undergraduate degrees in both Religious Studies and Ethnomusicology she has a foundation that extends far beyond traditional psychotherapy. In keeping with the contemporary wisdom for the treatment of addiction, Ellen has spent most of her career investigating how recovery, spirituality and creative expression are integrally related. Having taught in the past at California Baptist University, the University of Redlands and the College of the Desert, Ellen has recently joined the faculties at Common Ground and the Infinity Foundation, two leading non-profit organizations in the northern Chicago suburbs that specialize in providing provocative adult education for individuals who wish to continue college-level study without formally enrolling in a university structure. 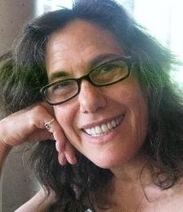 Ellen has been trained in Eriksonian hypnotherapy, and she is a certified practitioner of Holographic Memory Resolution and the Lifeline Technique. Her other interests include reading, writing, hiking, independent films, Ayurvedic medicine, yoga and playing music. 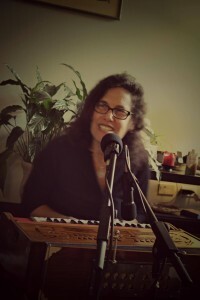 She currently sings with a small ensemble in Chicago, and plays the piano, percussion and guitar for fun. Maintaining a small practice in Los Angeles and Palm Springs, Ellen still commutes to the west coast every six to eight weeks. 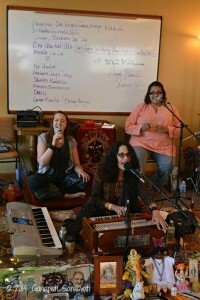 That’s ME & vocalist Karishma rehearsing with Radha for The Bhakti Caravan. 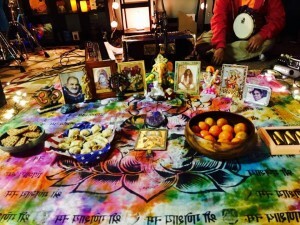 Kirtan, the spiritual practice of singing, chanting the Divine, began in India centuries ago. We are a group of individuals from the Chicagoland area mixing our vast diverse musical and spiritual backgrounds to bring forth an ever evolving eclectic sound combing rich vocals with tribal, blues, electronic, Indian & rock influences, dedicated to soul & spiritual expansion. The music carries the beautiful Sanskrit Chants of many Ancient Deities and High Energy Mantras. When we play this music, it allows the listener to go within themselves and then travel out to many foreign lands, cultures, different time periods and immerse themselves with the sacred chants. Many believe that chanting is one of the most powerful known ways to elevate your spirit and transform your energy from stuck to free, dense to open, or darkness to light. This is an inward journey where the music will work for you and take you to a state of incredible joy and mental clarity. This entry was posted in Authenticity, Creative Impostor Podcast Episodes, Creative Process, Energy, Featured, Identity, Impostor Syndrome, Mantra, Meditation by andrea. Bookmark the permalink.